I'm getting things ready for our first form drawing block of the 2nd grade year. We like to draw the forms as large as we possibly can outside on our back patio. It's an activity that necessitates A LOT of chalk. So we make our own. It's really simple. We use plaster of paris, tempera paint, and water. Then we pour our mixtures into toilet paper tubes lined with wax paper. We set our tubes on a FLAT surface (i.e. hardboard) with a double layer of wax paper underneath. You let them sit overnight in the tubes, and then peel them out and let them finish drying. If the weather cooperates, it takes about a day or two for them to fully dry. The ingredients are really inexpensive. 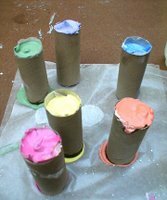 You can find plaster of paris and tempera paint at a craft store. I buy the regular tempera paint, not the washable. And the chalk works great. You can add as much color as you like, so you get really vibrant results. This will be so much fun to do! Thanks, I can't wait to make our very own chalk! How incredibly clever! I wish I had thought of making chalk when mine where younger. They still enjoy drawing on the sidewalk, but I think we will have to do it in the back now, Germans don't seem to find this sort of thing "endearing" in public spaces.